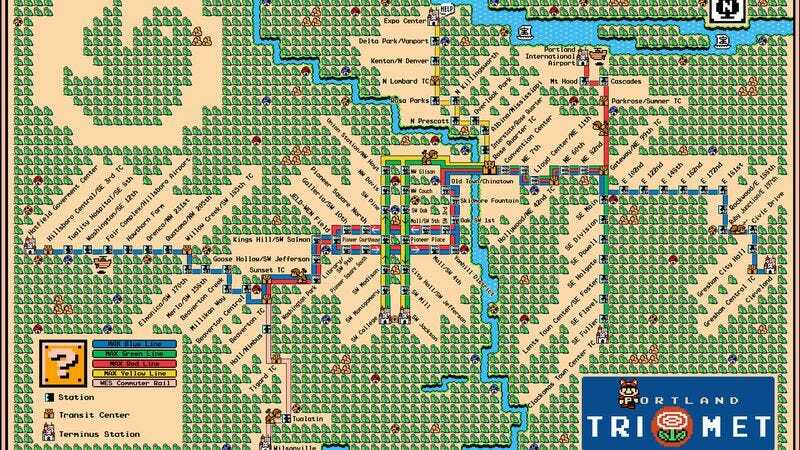 As if the sometimes-perilous world of public transportation didn’t already threaten to push the limits of the surreal, Super Mario Bros. 3-style transit maps are here to add the possibility of sprouting a raccoon tail and ears. Dave’s Geeky Ideas blogger Dave Delisle has Mario-ized public-transit maps of several North American metro areas, including Portland, Washington, D.C., the Bay Area (Mario Kart-style! ), Vancouver, Calgary, Montreal, and Toronto. Inspired by Delisle, ChicagoNow’s Robert Bacon also designed a CTA version. So, if your area’s not yet represented, and you’ve got the talent and the time—good God, so much time—maybe you can whip one up yourself. Just don’t forget to hold “down” on the arrow pad until you can walk behind your city’s buildings to get the Warp Whistle. Obviously.